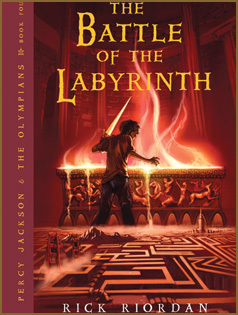 This fourth book in Riordan’s Percy Jackson & the Olympians series is vastly entertaining, as always. Within, Percy and his friends must enter the huge labyrinth that is under the surface of the earth, just beneath the mortal world. Grover goes in search of Pan, whom he is convinced is hiding out, to substantiate his claim to the Council of the Cloven Elders, who want to revoke his searcher’s license. Percy and Annabeth must stop Luke, who’s seeking to use the labyrinth to lead the army of Kronos into Camp Halfblood and destroy it. There are a few details I don’t care for in the series, like how the gods follow western civilization, moving Olympus from Greece to New York City. Other places move to America, as well, like the door to the Underworld and the stronghold of Kronos. I see why he does it, to create an American setting for his American readers and his American character, but it just seems wierd. The Labyrinth also moves and shifts and changes, so tunnels or rooms are never in the same location twice (except for Pan, who, incidentally, is still under the same state Grover found him in last year). And, of course, I’ve never really been keen on the whole premise of promiscuous, dysfunctional gods, but as it’s been pretty much in the background, I wouldn’t bar the series from my kids. But in The Battle of the Labyrinth, an intensification of some darker themes will probably put this series in the 12+ age category for my kids, along with the likes of Harry Potter. In this one, Kronos, who is the epitome of evil and who is seeking to destroy Olympia and western civilization, takes over Luke’s (a kid) body with Luke’s permission. This doesn’t settle too well with me. Yes, Luke is a bad guy, and I haven’t read the last book yet (which I suspect redeems Luke). In the meantime, I don’t think I want my kids reading this series until they gain a little more wisdom and maturity. AH! Now I see why Erik was asking me why Percy Jackson is OK for him to read LOL! As he stated, I think it’s the humor that sets it apart. I think is makes it a “not so serious” story. The dysfunctional god thing makes me cringe, but my kiddo doesn’t “get it” on that level. I also agree with the Luke possession (that was one section, among others in the series, we read together and talked about). This is a great balanced review! Ginny, I think you did hit on something there – the humor does lighten this series considerably. Riordan is hilarious! But it’s a tougher one to call. Good for you for reading with Erik. There were parts of Harry Potter that I discussed with my daughter, too, after we both finished reading it separately, even at age 12. She hasn’t been too interested in this series, so I haven’t pushed her toward it yet. You made me LOL with that comment to Erik, Michelle! You two have the same sense of humor!